Evolution MotorSports in conjunction with Moton USA, are proud to introduce a complete bolt-on suspension system for the late model 996 / 997 Porsche cars. 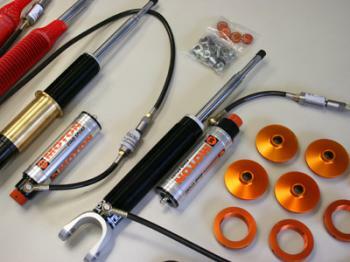 This ultimate suspension system is by far the finest quality and best handling suspension system on the market today. All of our suspension systems are designed to your specifications depending on your driving style, your geographical location, the weight of your vehicle and your power level. Most “off the shelf” suspension systems do not take these factors into account, thus they cannot perform perfect for your specific needs. We can custom tune the perfect suspension for YOU. Each system is carefully assembled with the finest CNC machined billet components, pressures set precisely in the external reservoirs and built with the proper spring rates.